New Delhi: India moved a step closer towards implementing the goods and services tax (GST) after the centre and the states struck a consensus on the rates and structure of the ambitious tax reform. However, the second and final day of the fourth GST council meeting on Friday is likely to be contentious, with both sides set to debate the sharing of administrative powers under the new tax regime. If they do manage to reach a compromise, India will have entered the last mile of GST—a tax reform that will for the first time economically unify the country into a common market by removing inter-state barriers to trade in goods and services. India aims to implement GST from 1 April 2017, but this will be contingent on both sides finalizing the design of GST, including the supporting legislation, in the next few weeks. On Thursday, the first day of the two-day GST council meet, the centre and the states signed off on a multi-tiered tax system. Addressing a press conference, finance minister Arun Jaitley said the aim was to minimize the inflationary impact on the common man while protecting revenues. “The decision was taken by complete consensus. All of the Congress finance ministers strongly supported the proposal in one voice," Jaitley said, implicitly taking a swipe at the Congress, which had blocked the constitutional amendment enabling GST for more than a year, demanding that tax rates under GST be capped at 18%. “A single GST tax rate would be highly inflationary," he said. As per the rate structure agreed upon by the council on Thursday, a zero tax rate will apply to 50% of the items present in the consumer price index basket, including foodgrains such as rice and wheat. 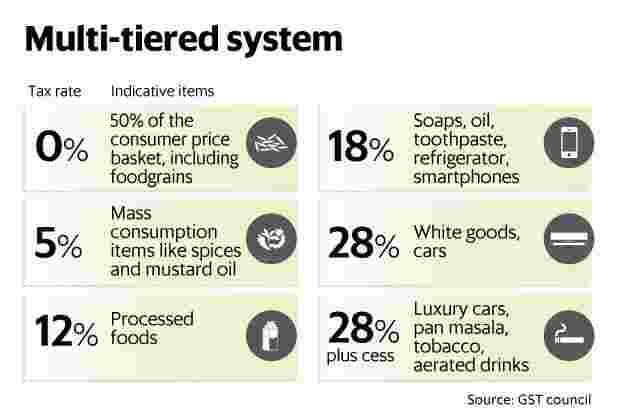 The next tax slab will be 5%, wherein items of mass consumption like spices, tea and mustard oil will be taxed. There will be two standard rates of 12% and 18% where a majority of the items used by the common man will be taxed. There will be a higher slab of 28% where items currently attracting a tax of 27-31% will be taxed. However, items used by the middle class such as toothpastes, soaps and refrigerators, which currently have a high tax incidence of more than 27%, will be brought down into the lower slab of 18%. “We should evolve modern tax categories that reflect contemporary consumption trends," said Haseeb Drabu, finance minister of Jammu and Kashmir. On so-called demerit and sin goods such as aerated drinks, luxury cars, tobacco and pan masala, a cess will be levied by the centre over and above the 28% slab. The cess will be levied in such a manner that the final tax incidence on such demerit items is not less than the existing tax rates. This cess amount, along with the proceeds of the clean energy cess, will be used to compensate states for losses arising from GST, estimated at Rs50,000 crore in the first year. This cess will have a sunset clause of five years. A technical committee comprising central government and state government officials will finalize the allocation of items into different rate categories. The tax rate on gold will be decided after this allocation of items. To be sure, this allocation will be finalized by the GST council. The states and the centre are also working on a similar tax structure for services, with most services being taxed at 18% and a few essential services at 12% and 5%. “The real action will now shift to which rate basket will goods and services fall and there lies the real game. The classification in different rate baskets is what will determine how sectors will fare under GST in comparison with the existing regime," said Harishanker Subramaniam, national leader, indirect tax, EY India.